A Government file which has been declassified suggests that MI5 or another wing of the security services might have provided intelligence on unionist parties in the aftermath of the Anglo-Irish Agreement. Documents in the file, which has been declassified at the Public Record Office in Belfast under the new 20-year rule, also suggest that the security services provided the Government with intelligence on Sinn Fein. But while it has long been known that the intelligence agencies bugged Sinn Fein, which at that point was openly defending the Provisional IRA at a point when it was carrying out indiscriminate terrorist attacks, the suggestion that Government security agencies might have been monitoring purely constitutional parties would have been hugely controversial at the time. The fact that the issue was raised at a ‘political’ meeting rather than a security discussion suggests that the information was probably related to political developments rather than those of loyalist paramilitaries, although there is scant detail of what information was produced. The first apparent reference to the security services having a role in assessing likely unionist reaction to the accord comes in a minute of the NIO’s Political Development Group on March 13 1987. Although the name of the individual providing the intelligence has been blacked out, the Public Records Office said that it had done so under two sections of the Freedom of Information Act which make clear that the individual was either a member or representative of an intelligence agency. Some 13 days after the meeting where the intelligence was first mentioned, another minute of the Political Development Group refers to the information which has been received: “It was agreed at a recent meeting of the Political Developments Group chaired by Mr Burns that I should submit this week an assessment of the likely reaction from the various unionist groupings to the introduction of the Public Order Order at the beginning of April. “The attached paper is the result of a collaborative effort by [redacted]. The security side of NIO (B) [the B indicates Belfast] have also been consulted. “The picture is far from clear. Developments over the last 48 hours have necessitated constant alterations to the draft, and although we have not wished to delay its issue any further, there will inevitably be further developments in the days ahead. Elsewhere in the file, the same form of redaction is used to remove the name of a person or organisation who was providing intelligence on Sinn Fein. In previous years, the NIO had a well-organised political affairs division which informally gathered intelligence on the major constitutional parties through regular meetings and phone calls with party members. 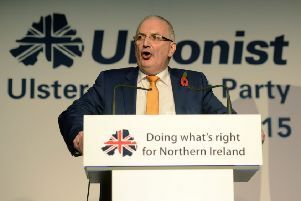 But in the wake of the agreement unionists boycotted the Government and while some unionists secretly kept talking to civil servants, many cut all ties, which might explain why an intelligence agency was asked to assist the Government in understanding unionist thinking.